We’re delighted to offer Get into Golf starter lessons, as part of the government-supported scheme to inspire adults to take up golf and play more often. Join one of our beginners or intermediate group classes or join our three-month lesson and playing programme, which have been specially developed to help beginners improve their swing and short game. 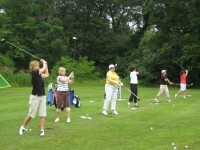 This programme gets the beginner onto the Golf Course as well as regular tuition. We know how daunting to get started in the game. Our programme makes the step much easier, as you are guided through each stage of tuition at your own pace. It also helps to know that you are starting with other beginners who are likely feeling the same way you do! For more information, email us at mark@markwatkinsgolf.com.